If you want o promote app in market with less investment, you might need to do some extra hard works. If you have just started to develop apps and released one or two. Then this is time, you need attention to promote your apps in the market. Promoting an app can be done in various ways. Some can promote in the market with as less as zero. However, spending a little in the right place can boost your app installation in the market exponentially. Currently there are over 3 million published apps in the market. Yours will might not get notice as soon as you are expecting. Ad budgets to have an app in top 25 exceed $200,000. So buying of user attention would cost higher with traditional app promotions. There’s several android related sites out there. Most of them have interests in both devices and apps in the market. They often write about the apps in their website and social media. This gets more attention to the user, and thus gets a good amount of installs from the market. You can start to collect information about each sites, their emails contact numbers. And then contact each one, requesting to write a review for your app. 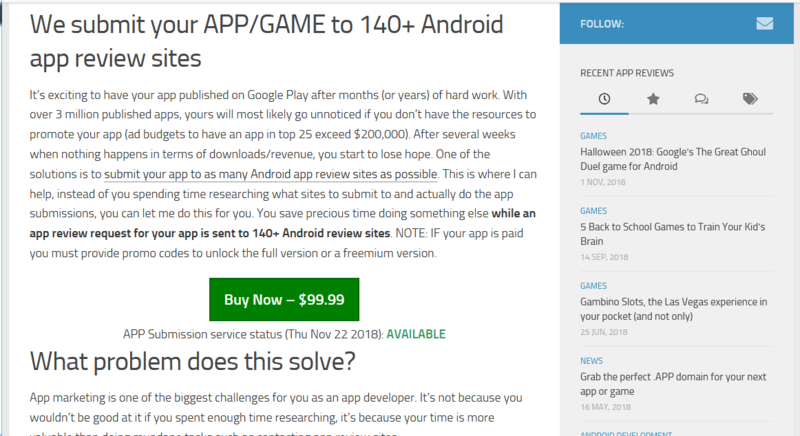 AndroidB offers to submit your app/game to 140+ android app review sites. Know more about their offer here. App marketing is one of the biggest challenges for you as an app developer. Its not because your time is more valuable than doing mundane tasks such as contacting app review sites. If you don’t want to spend dozens of hours – hunting down for Android app review websites and contacting them, then there are indeed companies. That will have big marketing budgets and they do have the most of the things you might need for an app promotion. In 99.99% of the cases The total cost for this service is $99 (as seen today). They will also feature your app on appsubmission.com .